The Watchmen movie soundtrack was composed by Tyler Bates. Watchmen director Zack Snyder and Bates listened to the soundtracks of 1980s films such as Manhunter, Blade Runner and To Live and Die in L.A. for inspiration. Snyder is also using a cover of Bob Dylan’s classic “Desolation Row” by My Chemical Romance for the closing credits. Most recently heard with the score to The Day The Earth Stood Still, award-winning film composer Tyler Bates offers a powerful, orchestral Original Motion Picture Score for his next blockbuster — Watchmen. Having scored two earlier films from Watchmen's Zack Snyder (300 and Dawn Of The Dead), Bates is rapidly gaining notice as the favorite composer of a new generation of directors. The physical CD, and a digital album will be available on March 3, 2009. The soundtrack features music from the likes of My Chemical Romance (who do a brand new cover of the Bob Dylan classic “Desolation Row”), as well as classic tracks from Nat King Cole, Billie Holiday, Jimi Hendrix, Simon & Garfunkel, and Janis Joplin, which are featured prominently in the film itself. Many of the popular and rock songs that Snyder included in the film’s soundtrack were also referenced within the pages of the original comic series. The physical CD, and a digital album will be available on March 3, 2009. Pirate Jenny - Nina Simone* (*end credits of the "Tales From The Black Freighter" DVD). 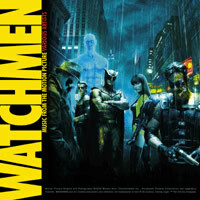 Watchmen Music Collectors Edition 7" Box Set will be released on March 24th. 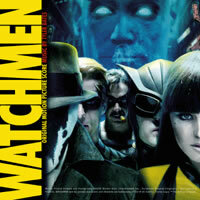 The box set contains 7 double-sided 7" picture discs of each Watchmen character on one side, and images in the likeness of the graphic novel on the other. The Watchmen Music Collectors Edition 7" Box Set will include My Chemical Romance’s “Desolation Row” from the soundtrack, along with 13 Tyler Bates tracks from the soundtrack. Limited edition 12" picture disc with artwork from the film has My Chemical Romance’s cover of Bob Dylan's “Desolation Row” and the instrumental track “Prison Fight” by Tyler Bates.